Good news, the dream apartment I mentioned in the last post is mine! I’ll move in next month, making it the 9th place I’ve lived at in LA. Let me summarize: when I first came to LA for just the summer at 19 I stayed in North Hollywood. I had such a great time that I did so again the summer after. Then when I returned for a six month stretch at 22 I stayed with a friend in Valley Village, followed by two months in Venice with a roommate from hell. Luckily I then met a lovely American lady in Culver City who I stayed with until my return to the Netherlands. And again during my three month last-attempt-to-find-an-agent stay (interrupted by a week and a half in Hollywood). Santa Monica & Marina Del Rey: Upper middle class to high class, right by the ocean, great restaurants and shops. Hip and classy. Oh and did I mention it’s right by the ocean? Culver City: Very residential, middle class, maybe slightly above. Has a cute city center with great restaurants and cocktail bars. Apparently the schools are good. Venice: Some areas are shabby, but in general it’s just very hippie. And bicycle friendly. Abbot Kinney is here, an upscale hipster and celebrity frequented area. The Venice Boardwalk is nice to ride your bike when it’s not too busy. Brentwood & The Pacific Palisades: High class, more residential area of the westside located in the Hills. Westwood: Home of many UCLA students and faculty. Has a lively city center with high buildings and what not. Beverly Hills & Bel-Air: Need I say more? West Hollywood: WeHo to insiders. All actors want to live here because it’s so cool, safe and central, but that of course comes at a price. Known for having a lot of LGBT inhabitants, which is probably why they have the most awesome annual Halloween parade. Some consider this Central LA. Century City: Sort of the business center of the Westside. Lots of talent agencies reside here. It also has the Century City Mall, which is where Ryan Gosling took Steve Carell shopping in Crazy, Stupid, Love. Hollywood: Attracts most of the tourists which is unfortunate since it’s not the nicest part of LA. Basically north of Santa Monica Blvd. everything’s fine, you have Sunset Blvd. where all the partying happens and the somewhat disappointing Walk of Fame. Basically the more you go north the fancier. But go so south and you’ll see some really dodgy neighbourhoods, all with a view of the Hollywood sign. Hollywood Hills: Big houses with stunning views. Echo park: Another one of those used-to-be-sketchy-but-now-it’s-artsy neighbourhood. Hancock park: Area for only the rich with crazy expensive mansions, all located around a private golf course. Larchmont: Cute little street with nice shops and restaurants and upper class housing. Love this area. Koreatown: Great Korean BBQ places. Mostly a little sketchy, but has some nice streets here and there. Downtown: The only part of LA with a city feel. Has subway stations, high buildings, pedestrians… Some parts are super nice during daytime, but do not go here at night. It’s one of the more dangerous places in LA, encompassing the notorious Skid Row and Compton. Perhaps those are technically East LA, but it’s all Central LA to me. Studio City: Where the studios are (surprise!) and thus some theme parks. Rest of it is very residential, a little above middle class. Toluca Lake: I always feel like this is the Los Feliz equivalent of the valley. Hipsterish and nice. North Hollywood: NoHo to insiders. A mix between sketchy and artsy, they’re really pushing to be know for the artsy, cultural side though. Burbank: Very residential, mostly safe. Angelenos are born and raised here. Sherman Oaks: More urban, business-y area of the Valley. Has a nice mall and the famous Sherman Oaks Galleria. That’s it! Well, not really, there’s also East and South LA but I haven’t really been there and there isn’t too much those areas are know for besides maybe Long Beach and Pasadena. But Angelenos consider those areas far, far away. And if an American considers something far, a Dutch girl from the middle of nowhere considers it the far side of the moon. Hope this helps all of you prospective vistors! Like this blog? Please show some love by sharing! And don’t forget to sign up for free e-mail updates by clicking on the I Want to Follow button on the upper right! Thanks for this post! I’d tried to ask my twitter followers, because I know some of them are from L.A., but I never got any answer. That was my biggest worry; which area was safest to live. I’m thinking NoHo since another blog (ImMovingToLA.com) also said NoHo was pretty awesome. I can’t wait! I’m planning on by Oct. 2014. 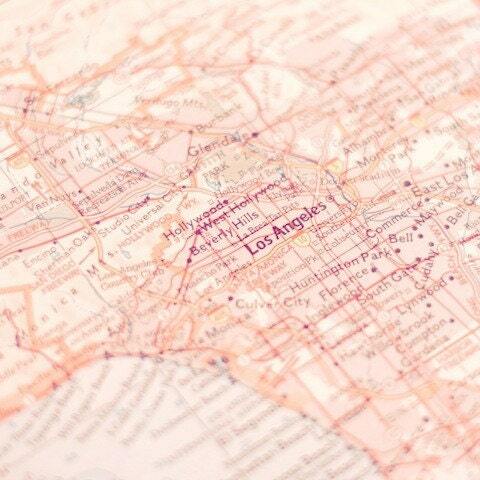 You haven’t mentioned in this blog post which part of LA have you inhabited? And is it the neighborhood you would recommend to most starting actors in LA? Gosh, thanks for taking the time to write all this. It is pretty exhaustive. I wanted to ask you a question. Are you allowed under the O1B visa to direct/act/write/produce? I was curious because the O1B visa is for eveybody working in the motion picture business and I want to find out if it only limits you to acting jobs and nothing else. You are only allowed to work the job you got your O1 for. But you can get an O1 for more than one job. And the O1 isn’t just for people in the film industry, also scientists, athletes…anyone with a special talent really! Great list. I am also looking for a place in La right now. It’s been so hard for me to find something. So your new place of your own is in hollywood? What was your budget for rent? Do you have a day job yet?